The neuronal ceroid lipofuscinoses (NCLs) are the most common cause of childhood dementia and are invariably fatal. Early localized glial activation occurs in these disorders, and accurately predicts where neuronal loss is most pronounced. Recent evidence suggests that glial dysfunction may contribute to neuron loss, and we have now explored this possibility in infantile NCL (INCL, CLN1 disease). We grew primary cultures of astrocytes, microglia, and neurons derived from Ppt1 deficient mice (Ppt1−/−) and assessed their properties compared to wildtype (WT) cultures, before co-culturing them in different combinations (astrocytes with microglia, astrocytes or microglia with neurons, all three cell types together). These studies revealed that both Ppt1−/− astrocytes and microglia exhibit a more activated phenotype under basal unstimulated conditions, as well as alterations to their protein expression profile following pharmacological stimulation. Ppt1- /− astrocytes also displayed abnormal calcium signalling and an elevated cytoplasmic Ca2+ level, and a profound defect in their survival. 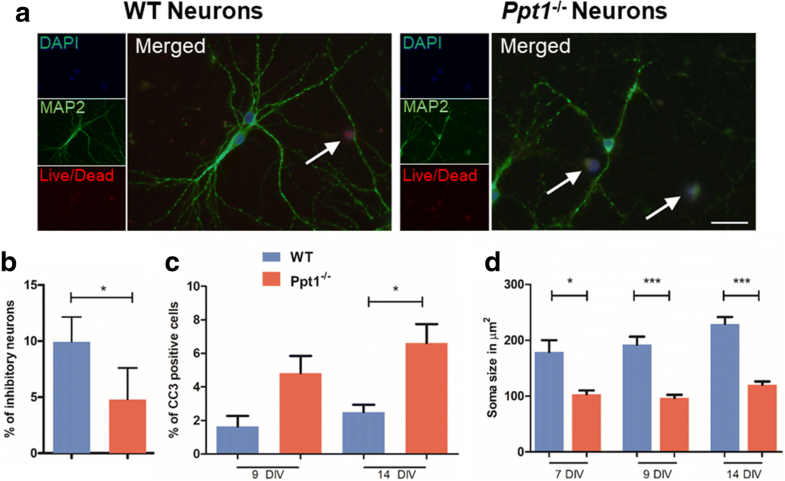 Ppt1−/− neurons displayed decreased neurite outgrowth, altered complexity, a reduction in cell body size, and impaired neuron survival with prolonged time in culture. In co-cultures, the presence of both astrocytes and microglia from Ppt1−/− mice further impaired the morphology of both wild type and Ppt1−/− neurons. This negative influence was more pronounced for Ppt1−/− microglia, which appeared to trigger increased Ppt1−/− neuronal death. In contrast, wild type glial cells, especially astrocytes, ameliorated some of the morphological defects observed in Ppt1−/− neurons. These findings suggest that both Ppt1−/− microglia and astrocytes are dysfunctional and may contribute to the neurodegeneration observed in CLN1 disease. However, the dysfunctional phenotypes of Ppt1−/− glia are different from those present in CLN3 disease, suggesting that the pathogenic role of glia may differ between NCLs. The neuronal ceroid lipofuscinoses (NCLs, or Batten disease) are a large group of inherited lysosomal storage disorders, each caused by mutations in an individual gene [8, 32]. The age of onset and rate of disease progression are determined by which gene is deficient, and which mutation is present within that gene. The NCLs are collectively the largest cause of childhood dementia and share a range of similar clinical features, including loss of vision, epileptic seizures, and declines in mental and motor abilities, all invariably leading to premature death [2, 9, 50]. Despite recent advances in the treatment of late infantile NCL (CLN2 disease) via enzyme replacement therapy , the other forms of NCL all remain untreatable. This includes infantile NCL (INCL or CLN1 disease), an earlier onset and more rapidly progressing form of NCL, which is caused by a mutation in the CLN1/PPT1 gene (Vesa et al., 1995; [5, 21]). However, it remains unclear how deficiency in palmitoyl protein thioesterase-1 (PPT1), the lysosomal enzyme encoded by this gene results in the devastating neurodegenerative impact upon the brain that typifies CLN1 disease. The generation of an INCL mouse model (Ppt1−/− mice)  has made it possible to study the consequences of PPT1 deficiency [3, 23, 29], and test a range of pre-clinical interventions . These mice display a progressive CLN1 disease-like phenotype, with well-defined declines in behavioural and neurological performance, and degenerative changes that are most pronounced within the thalamocortical system and cerebellum. Characteristically these mice display a profound activation of both microglia and astrocytes, which precedes neuron loss [23, 29]. The regional localization of this glial activation correlates closely with distribution of subsequent neuron loss, leading to the suggestion that these events may be causally related. Rather than their traditional supportive role, evidence is emerging that both astrocytes and microglia can directly contribute to neuron loss in a variety of disease states . Amongst these are several lysosomal storage disorders [11, 41, 48], including the juvenile form of NCL, CLN3 disease or JNCL [35, 51]. We have recently shown via primary cultures derived from Cln3 deficient mice that astrocytes and microglia are both dysfunctional, and when co-cultured can harm healthy neurons and kill Cln3 deficient neurons, suggesting a direct influence of glia upon the pathogenesis of this form of NCL . The extent of glial activation is much more pronounced in CLN1 disease, but as longitudinal studies show [23, 29], still accurately predicts the sites where neuron loss subsequently occurs. This raises the question of what the role of glia in this most profoundly neurodegenerative form of NCL may be. As a first step to resolving this question, we derived primary cultures of either astrocytes or microglia from Ppt1−/− mice, and compared their properties and response to stimulation to those derived from wild type controls. This in vitro study revealed a range of abnormal phenotypes different to those seen in Cln3 disease glia . Ppt1−/− astrocytes and microglia both appeared more activated than WT cells under basal unstimulated culture conditions. However, most notable was a profound defect in the survival of Ppt1−/− astrocytes, which also displayed marked dysregulation of intracellular calcium handling, and subsequent death by apoptosis. Primary cortical neuron cultures from Ppt1−/− mice displayed abnormal dendritic morphology and impaired survival, especially of interneurons. Using a co-culture system wild type glia ameliorated these neuronal phenotypes, whereas Ppt1−/− astrocytes predominantly impaired the morphology of WT neurons, and Ppt1−/− microglia appeared to trigger increased Ppt1−/− neuronal death via apoptosis. These effects were more pronounced in mixed glial co-cultures when both Ppt1−/− astrocytes and microglia were grown together with neurons. Taken together, these data suggest that the dysfunction of astrocytes and microglia in CLN1 disease is detrimental to neurons and may lead to their loss. Homozygous Ppt1 deficient (Ppt1−/−) mice were originally created through the deletion of the last exon in the Ppt1 coding sequence , and were subsequently bred for at least 10 generations onto a C57/BL/6 J background . The colony was maintained together with a colony of C57/BL/6 J wild type (WT) control mice originally derived from the crossing of heterozygous Ppt1+/− mice. All animal maintenance and experimental procedures were carried out according to the UK Scientific Procedures (Animals) Act (1986). Mixed glial cells were isolated from post-natal day 1–5 (P1-P5) Ppt1−/− or WT mouse cerebral cortices, as previously described [31, 35]. Cultures reached confluence after 10–14 days, at which point they were composed of a base layer of non-dividing astrocytes and an upper layer of microglia as well as a few oligodendrocytes. To generate astrocyte cultures, microglia were removed by shaking cultures at 180 rpm for 10–12 h in a humidified incubator (5% CO2, 37C, (). The remaining astrocyte monolayer was treated with cytosine arabinoside (Ara-C) for 7 days to abolish any remaining dividing cells. Astrocytes for immunofluorescence staining experiments were plated at 1.5 × 104 cells per well onto poly-D-lysine (PDL, 25μg/ml, Sigma) coated glass coverslips in 24 well plates. For all functional assays unless otherwise described, astrocytes were plated at 14.25 × 104 cells per well onto PDL coated 6 well plates and kept in phenol-red-free DMEM supplemented with 4500 mg/L glucose (Sigma, Poole, UK), to prevent the presence of phenol red from providing a background interference. Microglial cultures were isolated from mixed glial cultures using the shaking method described above [31, 35]. The harvested cells were resuspended in RPMI 1640 supplemented with 5% FBS, P/S, 2 mM L-Glutamine, macrophage colony-stimulating factor and granulate macrophage colony-stimulating factor, and consequently plated on PDL coated (as above) 1.5 cm coverslips placed in 24 well plates. They were maintained for 5 days, before growth factors were removed for a further two days. At the start of all experiments, all glial cultures had been maintained for approximately 21 days, yielding cultures of > 99% purity. Due to the difficulty of detaching microglia from PDL coated plastic surfaces, a different method was used to generate microglia for co-culturing with either astrocytes or neurons. These microglia were prepared from P3-P5 Ppt1−/− or WT mouse cerebral cortices, initially generating mixed glial cultures as described above. Conditioned medium from these mixed cultures was collected and cultures subsequently incubated at 37 °C with 1 mL/well of Trypsin-EDTA (0.5mgml-1, Sigma). After 45 min the cell monolayer, consisting primarily of astrocytes, was removed along with the supernatant and discarded. The remaining microglial cells were washed before being incubated in a 1:1 mixture of conditioned and fresh medium. These microglial cultures were ready to be used in co-culture experiments after 48 h, when they were removed from wells using 0.5 ml Accutase (Sigma) and a cell scraper (Corning). Microglia were then added to co-cultures at a concentration of 50 × 104 cells/ml per well. Neuronal cultures were generated from P0 Ppt1−/− and WT mouse cortices as previously described  and plated on PDL-coated 13 mm coverslips placed in 24 well plates at a concentration of 15 × 104 cells/cm2. These cultures were maintained for 7, 9 or 14 days. Neurons to be grown in co-cultures were plated onto 19 mm diameter coverslips in placed in 12 well plates at a concentration of 15 × 104 cells/cm2. After 7 days, glial cells previously maintained in culture for 21 days were added to these neurons at a density of 100 × 104 cells/ml for astrocytes or mixed glia, and 50 × 104 cells/ml for microglia. Additional coverslips plated with just glia (either astrocytes, microglia or of mixed glia), or only neurons were set up as control conditions. Co-cultures were grown for an additional 2 or 7 days before commencing analysis, making the neuronal cultures used in these experiments 9 or 14 days old. The composition of 14 day old neuronal cultures was assessed using cell type-specific phenotypic markers, as described below. Astrocytes were stimulated with lipopolysaccharide (LPS, 1 μg/ml LPS, Sigma) and interferon-gamma (IFN-γ, 100 U/ml, Thermo Scientific) for 24 or 48 h, while microglia were stimulated with LPS alone for either 6 or 24 h . Mixed glial cultures were stimulated for 24 h using both stimuli. Cultures were fixed in 4% PFA and stained as previously described  and across all experiments, nuclei were counterstained with DAPI. Cell type-specific markers were used to assess culture composition, with glial fibrillary acidic protein (GFAP, Rabbit polyclonal, 1:500, Dako) being used to identify astrocytes, Cluster of Differentiation 68 (CD68, Rat monoclonal, 1:250, Serotec) to identify microglia, Map2 MAP2 (mouse monoclonal, 1:1000, Abcam) to identify neurons and O4 (Mouse monoclonal, 1:100, Covance) to identify oligodendrocytes. Cytoskeletal components were examined by staining cultures with Phalloidin, α- and β-tubulin (monoclonal and polyclonal antibodies respectively, both from Sigma and used at 1:1000). All secondary antibodies were used 1:1000 and obtained from Invitrogen. Coverslips were mounted using Fluoromount G and stained cells were visualized using a Zeiss AxioImager Z1 microscope (Carl Zeiss, Ltd) and images captured with a monochrome AxioCamMR3 camera, using AxioVision 4.8 Imaging software. Images of 10 random fields were taken per coverslip of GFAP stained, non-overlapping astrocytes and soma size was measured using ImageJ (National Institutes of Health, Bethesda, MD). Neuron soma size and neurite length were measured using ImageJ on images of 10 random fields per coverslip in neuronal cultures or 20 random fields per coverslip in co-cultures. The length of the longest neurite was obtained per neuron; as well as mean neurite length per neuron. The morphological response of microglia to stimulation was assessed by assigning cells to 3 sub categories; Type 1 microglia which exhibit extended processes and an elongated cell body, Type 2 microglia with retracted processes and a rounded cell body and Type 3 microglia exhibiting a very small, rounded cell body. 5 random fields of at least 200 cells were counted per coverslip per condition and the percentage of each subtype was determined . Cell viability in WT and Ppt1−/− astrocyte cultures was assessed using a Live/Dead kit (Invitrogen) according to the manufacturer’s instructions. Briefly, Live/Dead dye was diluted in DMSO and added 30 min prior to fixation of cultures 24, 48 or 72 h after plating astrocytes onto coverslips. Astrocyte cultures were then co-stained with GFAP and 10 random fields were counted per coverslip. Astrocytes were plated in μ-Slide 8 well imaging dishes (Sigma) at 1.5cells/cm2. Cells were loaded with 5 μM Fura2-AM (Teflabs) in DMEM with 1% BSA and 0.025% Pluronic acid F127 for 1 h at room temperature, before being washed in imaging buffer (HBSS, 1 mM HEPES and 1 mM MgCl2) and left at room temperature for 10 min. Intracellular Ca2+ concentrations and responses were recorded with a Colibri LED microscope system, using an Axiocam Mrm CCD camera and Axiovision software (Version 4.7) with an additional physiology module for live cell Ca2+ imaging (Zeiss). Recordings of the Ca2+ probe baselines were taken prior to agonist addition in order to provide basal Ca2+ measurements of the cell, and all agonist-induced responses were compared at peak height. Release of endoplasmic reticulum (ER) Ca2+ was measured after addition of 5 μM of thapsigargin (Sigma). Lysosomal Ca2+ release was measured using a method adapted from . Following with 5 μM ionomycin (Calbiochem) to prevent release from intracellular Ca2+ stores, the addition of 10 μM nigericin (Sigma) was used to induce Ca2+ release from the lysosome. To examine store operated Ca2+ entry, ER Ca2+ release was triggered as described, and following return to the baseline, 1 mM Ca2+ was added to the imaging medium. In order to trigger Ca2+ plasma membrane influx, 100 μM ATP (Sigma) was added after astrocytes were loaded with Fura2-AM in imaging buffer and 1 mM CaCl2. To compare pharmacologically stimulated cytokine secretion by WT and Ppt1−/− glia, supernatant was collected from mixed glial, astrocyte and microglial cultures and analysed with ELISA kits (Signosis, Santa Clara, CA). A mouse oxidative stress ELISA kit was selected to quantify microglial cytokine secretion based on previous evidence that Ppt1−/− neurons exhibit signs of oxidative stress , a custom mouse cytokine ELISA kit was used to examine cytokine secretion by astrocytes based on pilot cytokine data generated in our laboratory, and cytokine secretion in mixed glial cultures was assessed with a mouse cytokine ELISA kit (all kits from Signosis). All these experiments were carried out according to the manufacturer’s instructions. All data were collected into Microsoft Excel spreadsheets and analysed in Graphpad Prism. All data are presented as mean ± SEM. A student’s t-test was used to analyse data between two groups, data sets with more than two groups were analysed with a one-way ANOVA using Bonferroni’s correction. All experiments were repeated in triplicate, using three technical replicates per experiment, unless otherwise stated. Data were considered statistically significant if p ≤ 0.05, p values are marked * if p ≤ 0.05, ** if p ≤ 0.01 and *** if p ≤ 0.001. Astrocyte activation can be observed as early as 3 months of age in Ppt1−/− mice, and progressively becomes more pronounced and widespread towards the later stages of the disease [23, 29]. Before comparing the in vitro phenotypes of Ppt1−/− and WT astrocytes we first defined the cellular composition of our astrocyte cultures. One week after plating, over 99% of DAPI positive cells in astrocyte cultures of either genotype were positive for the astrocyte marker glutamine synthetase (GS) (WT: 99.2% GS + ve, 0.71% CD68 + ve, and 0% O4 + ve; Ppt1−/−: 99.6% GS + ve, 0.35% CD68 + ve, and 0% O4 + ve). Using GFAP as a marker whose increased expression is associated with astrocyte activation, we first compared the morphology of astrocytes in cultures derived from mice of both genotypes, under both basal and simulated conditions (Fig. 1A). Under basal conditions the morphology of cultured Ppt1−/− astrocytes was more heterogeneous than that seen in WT cultures, with many GFAP-positive astrocytes appearing larger in Ppt1−/− cultures (Fig. 1A). 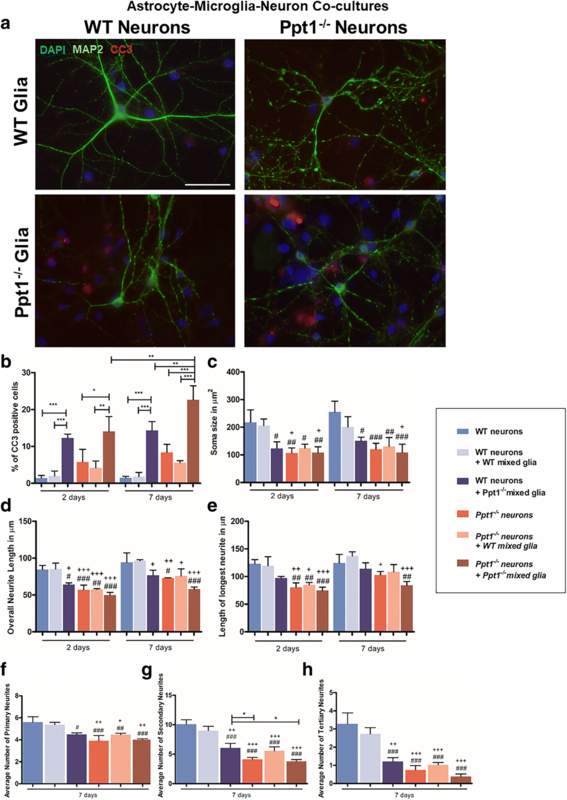 The proportion of GFAP-positive cells under basal unstimulated conditions was significantly higher in Ppt1−/− astrocyte cultures than in WT cultures (Fig. 1B). Cultures were then stimulated with LPS and IFNγ, to examine astrocyte response to a standardized pharmacological stimulus . Although the proportion of GFAP-positive astrocytes was significantly upregulated in WT cultures after both 24 h and 48 h of stimulation, no further changes in the proportion of GFAP-positive astrocytes were observed in Ppt1−/− cultures upon stimulation (Fig. 1B). 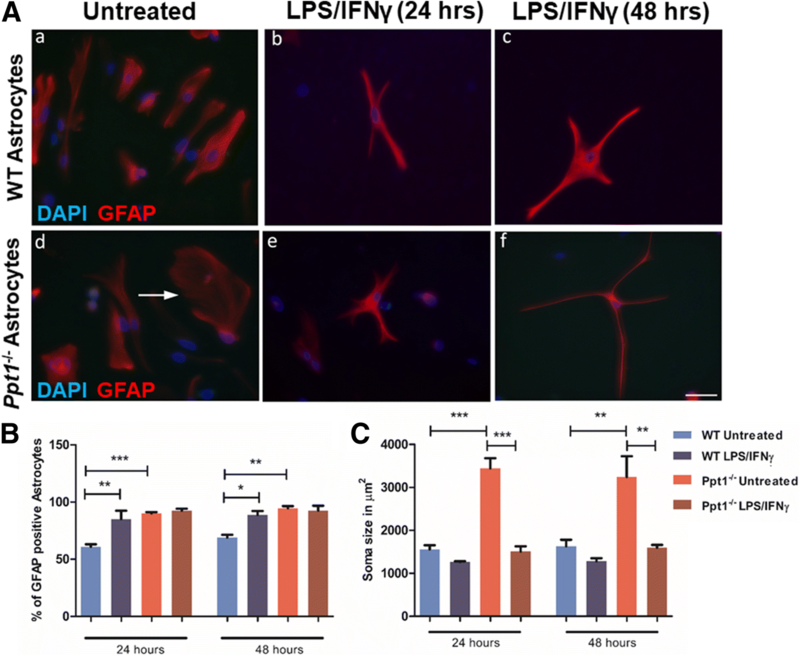 These data reveal that although more Ppt1−/− astrocytes express GFAP under basal culture conditions, this proportion does not increase further upon stimulation with LPS/ IFNγ, as it does with WT astrocytes. To quantify the morphological responses of astrocytes to stimulation, we measured astrocyte soma size (Fig. 1C). Under basal conditions, Ppt1−/− astrocytes exhibited a markedly and significantly larger soma size than WT astrocytes. However, upon stimulation for 24 or 48 h Ppt1−/− astrocytes dramatically reduced their cell body size, a typical response of cultures astrocytes to pharmacological stimulation, so that they were now of a similar size to stimulated WT astrocytes at either time point (Fig. 1C). Taken together these data reveal that although appearing morphologically different to WT astrocytes under basal conditions, Ppt1−/− astrocytes still respond robustly to pharmacological stimulation by changing their shape. Increased secretion of specific soluble proteins is a hallmark of astrocyte activation (Lucas et al., 2006), and we used an ELISA kit to investigate the release of soluble factors following stimulation in our astrocyte cultures. No significant differences in the release of TNFα, IL-1α, IFNγ, FGFB, or EGF were observed between WT and Ppt1−/− astrocytes following 24 h exposure to LPS and IFNγ (Fig. 2). However, significantly higher amounts of IL-4, SCF and VEGF were released by Ppt1−/− astrocytes (35.98 ± 17.80%; 10.74 ± 3.98%; 5.90 ± 4.16% more, respectively) than by WT astrocytes (− 14.12 ± 9.39%; − 1.68 ± 3.47%; − 12.61 ± 3.02% less, respectively) (Fig. 2). Not only does this provide further evidence that Ppt1−/− astrocytes respond differently to stimulation than their WT counterparts, but is also in marked contrast to data obtained from Cln3−/− astrocytes which exhibit reduced release of soluble factors following stimulation . Furthermore, lactate secretion from Ppt1−/− astrocytes was significantly increased 1.4 fold (p < 0.05, data not shown) under basal conditions, which may point towards the possibility of mitochondrial dysfunction as shown in aging and prematurely aging mice , with mitochondrial failure and a shift in transcriptional activities of lactate dehydrogenases resulted in increased brain lactate levels. Mitochondrial dysfunction is closely linked with oxidative stress and has previously been reported in other forms of the NCLs (; Jalanko et al., 2009). There are fewer cells that stain positively for GS or S100β in 6 month old Ppt1−/− mice , suggesting that astrocyte survival may be impaired in CLN1 disease in the later stages of disease progression. These data prompted us to investigate Ppt1−/− astrocyte survival in our cultures, and during our immunofluorescence staining experiments, we noticed fewer DAPI-stained nuclei in Ppt1−/− astrocyte cultures under all basal and stimulated conditions. Counts of the number of DAPI-stained cells in these Ppt1−/− astrocyte cultures confirmed they were significantly reduced in number (Fig. 3a). However, no significant differences in the percentage of proliferating cells was observed in Ppt1−/− astrocyte cultures (data not shown), and as such could not account for significantly reduced number of astrocytes in these cultures. Consequently, a Live/Dead kit was used to investigate cell survival 24, 48 and 72 h after plating the cells onto coverslips (Fig. 3b, c). Across all time points, significantly more astrocytes were positive for both GFAP and for the Live/Dead marker in Ppt1−/− cultures, indicative of them undergoing cell death (24.83 ± 1.49%; 25.87 ± 1.78%; 34.99 ± 4.66%, at 24, 48 and 72 h respectively) compared to their WT counterparts (7.95 ± 1.08%; 10.57 ± 2.10%; 14.09 ± 1.08% at 24, 48 and 72 h respectively) (Fig. 3b, c). These data reveal that Ppt1−/− astrocyte survival is markedly impaired in vitro, suggesting an inherent vulnerability of Ppt1−/− astrocytes rather than any defect in their ability to proliferate. Although these tissue culture data for impaired astrocyte survival are consistent with our previous histological evidence from the Ppt1−/− brain , it remains unclear what the extent and nature of astrocyte death may be in vivo, and it will be important to resolve this issue. De-regulated Ca2+ signalling has been implicated in the pathogenesis of several neuro-degenerative disorders, including several lysosomal storage disorders (reviewed in Lloyd-Evans, 2016). After the endoplasmic reticulum (ER), the lysosome represents an important intracellular Ca2+ store [6, 26]. Thapsigargin is an inhibitor of the sarco/endoplasmic reticulum ATPase (SERCA) that at high concentrations induces Ca2+ release from the ER by blocking uptake and uncovering the ER leak channels (Chandrachud et al., 2015). Nigericin is a H+/K+ ionophore that will release Ca2+ from both lysosomes and mitochondria by collapsing the H+ gradient . However, prior pre-treatment with ionomycin results in Ca2+ release from all intracellular stores apart from lysosomes, where its action is blocked by the lysosomal glyocaylix, meaning that resultant effects of nigericin on Ca2+ release are solely from lysosomal stores . The base-line level of cytoplasmic Ca2+ was significantly elevated in Ppt1- /− astrocytes (Fig. 4a), suggesting that they are more stressed than their WT counterparts, and this likely caused by the significantly higher number of spontaneous Ca2+ release events that we observed in the Ppt1−/− astrocytes (data not shown). Stimulation of Ppt1- /− and WT astrocytes with thapsigargin revealed no difference between genotypes in the level of Ca2+ released from the ER (thapsigargin, Fig. 4b) or from lysosomes (ionomycin/nigericin, Fig. 4c) or, suggesting Ca2+ release from these intracellular stores was unaffected in Ppt1- /− astrocytes. ATP mediated intracellular Ca2+ elevation was significantly lower in Ppt1- /− astrocytes (Fig. 4d), and following thapsigargin depletion of the ER there was a small, but significant, increase in store operated Ca2+ entry in Ppt1- /− astrocytes (Fig. 4e). Taken together these data suggest that Ppt1- /− astrocytes display marked abnormalities in Ca2+ signalling with elevated levels of both spontaneous Ca2+ release events and resting basal cytoplasmic Ca2+ that may be related to their pronounced survival defect. Alongside activation of astrocytes, microglial activation is also evident in Ppt1−/− mice as early as three months of age with marked up-regulation of CD68 . We first defined the cellular composition of our microglial cultures. One week after plating microglial cultures showed over 99% of DAPI stained cells expressed CD68 (99.1 and 99.8% CD68 + ve in WT and Ppt1−/−, respectively; with only 0.89 and 0.14% being GFAP+ve). To assess the in vitro properties of Ppt1−/− microglia, we first assessed their ability to undergo morphological transformation following pharmacological stimulation with LPS, a response that is impaired in Cln3 deficient microglia . Following stimulation with LPS, WT and Ppt1- /− microglial cultures were stained with CD68 and α-tubulin, and as described previously cells were classified into 3 morphological subcategories: type 1 cells – microglia with extended processes (non-activated); type 2 cells – microglia with retracted processes (partly activated); type 3 cells– rounded cells with a small soma (fully activated) . Under basal conditions, the vast majority of CD68-positive microglia in WT cultures exhibited a bipolar or rod-like morphology (Fig. 5A). Quantitatively these Type 1 cells were the predominant microglial subtype in WT cultures (Fig. 5B). In contrast, far fewer Type 1 cells were present in Ppt1−/− microglial cultures under basal conditions (Fig. 5B), with the majority of CD68-positive microglia exhibiting a rounded Type 2 morphology (Fig. 5C). As expected, following LPS stimulation WT microglia rounded up, and Type 2 microglia became the prevailing cell type in these cultures (Fig. 5C). Little change in Ppt1−/− microglial morphology was observed following stimulation for 6 or 24 h, potentially because these mutant microglia already appeared morphologically to be activated (Fig. 5A, C). Very few Type 3 microglia were observed in either WT or Ppt1−/− microglial cultures (data not shown), consistent with previous observations that prolonged stimulation is required to fully activate microglia to become small and rounded . Taken together these data suggest that Ppt1−/− microglia appear morphologically to be already activated under basal conditions and do not dramatically alter their morphology any further when stimulated pharmacologically. Oxidative stress has previously been suggested to play a role in poor cellular health in patient derived primary Ppt1−/− deficient fibroblasts . Because microglia are implicated in mediating the effects of oxidative stress [7, 13], we investigated the release of soluble proteins typically associated with oxidative stress from Ppt1−/− microglia. ELISA assays of these proteins revealed no significant differences in the release of TNFα, TGFβ, IL-1α, IL-6, IL-10, IL-12 or MCP-1 from WT and Ppt1−/− microglial cultures (Additional file 1: Figure S1). However, the release of IL-1β was significantly higher in Ppt1−/− cultures (5.48 ± 4.32%) following 24 h stimulation than in WT cultures (− 8.41 ± 2.04%), suggesting that Ppt1−/− microglia may adapt a more inflammatory phenotype upon stimulation than WT microglia (Additional file 1: Figure S1). It will be important to provide Ppt1−/− microglia with an oxidative stress stimulus and determine if the expression of these factors is further altered. Before defining the impact of Ppt1 deficient astrocytes or microglia upon neurons, we first assessed neuronal culture composition. In neuronal cultures > 82% of cells stained positively for Map2 (16% GFAP positive, 0.3% CD68 positive) after 7 days, and > 93% Map2 positive (5% GFAP positive, 3% CD68 positive) after 14 days. We then compared the survival and morphology of cultured primary cortical neurons derived from WT and Ppt1−/− mice (Fig. 6a). Inhibitory neurons are amongst the most vulnerable cells in Ppt1−/− mice , and although there was little difference in overall cell number between Ppt1−/− and WT neuronal cultures after 7 DIV (data not shown), the percentage of inhibitory neurons stained with a cocktail of antibodies against the interneuron markers parvalbumin, calbindin and calretinin was significantly lower in Ppt1−/− cortical neuron cultures (4.79 ± 1.41% vs 9.94 ± 1.10% WT) (Fig. 6b). Subsequently, after 14 DIV a significantly higher proportion of cells in Ppt1−/− neuronal cultures stained positive for cleaved caspase 3 (6.61 ± 1.13% vs 2.49 ± 0.45% WT), suggesting their impaired longer-term survival in vitro (Fig. 6c). We also quantified neuronal morphology as an indicator of in vitro development and neuronal health, and first revealed that the soma size of Map2-positive neurons was significantly smaller in Ppt1−/− cultures at all time points (Fig. 6d). Assessing neurite complexity (Fig. 7), revealed that at 7, 9, and 14 DIV the mean neurite length was significantly shorter in Ppt1−/− vs. WT neurons (Fig. 7a), as was the length of their longest neurite, (Fig. 7b) which by 14 DIV is typically the axon [12, 14, 46]. Changes in neurite morphology were readily apparent in Map2 stained cultures (Fig. 7c), but quantitative analysis revealed specific arborization defects. Although the average number of primary neurites was similar between neurons of both genotypes (Fig. 7d), Ppt1−/− neurons had significantly fewer secondary (Fig. 7e) or tertiary (Fig. 7f) neurites at 7 DIV. Taken together these data suggest that Ppt1−/− neurons not only show impaired morphology in vitro, suggesting they are in poor health, but also display a moderate impairment in their survival. It will now be important to study neuronal arborization in vivo, to see whether these findings are corroborated in Ppt1-deficient mice. To assess the impact of Ppt1−/− astrocytes or microglia on each other, or WT and Ppt1−/− neurons, we grew these cell types together in different combinations (e.g. astrocytes with microglia, neurons with astrocytes, neurons with microglia, neurons with both astrocytes and microglia), using the morphological phenotypes defined above and survival as outcome measures as outcome measures. As such, for co-cultures were stained with Map2 and CC3, soma size as well as neurite length and complexity were measured and the percentage of cells undergoing apoptosis was determined. Where appropriate, microglia were labelled with CD68 and astrocytes with GFAP. We first assessed different co-culture combinations of astrocytes and neurons of different genotypes, which revealed obvious effects upon neuron survival and morphology (Fig. 8a). Quantifying these changes, cell death in neuron-astrocyte co-cultures, as revealed by CC3 immunostaining, was significantly greater when Ppt1−/− astrocytes were present (Fig. 8b), either in combination with WT neurons (13.41 ± 2.18%) or Ppt1−/− neurons (14.03 ± 2.61%). This cell death was predominantly of astrocytes rather than neurons, as there was little correlation between the overall percentage of CC3-positive cells, and those positive for both CC3 and the neuron marker Map2 (data not shown). Less cell death was evident in Ppt1−/− neuron/WT astrocyte co-cultures (Fig. 8b), but this difference was not statistically significant. In contrast, Ppt1−/− astrocytes appeared to have a detrimental impact on neuronal health, as judged by neuronal morphology. When grown with Ppt1−/− astrocytes, WT neuronal soma size was significantly reduced (Fig. 8c), with decreased mean neurite length (Fig. 8d), but not of the longest neurite, probably the axon (Fig. 8e). These effects were more pronounced after 7 days in co-culture, when WT neurons started resembling Ppt1−/− neurons morphologically (Fig. 8a). Although Ppt1−/− astrocytes did not adversely impact Ppt1−/− neuron soma size after 7 days in co-culture (Fig. 8c), the neurites of these Ppt1−/− neurons were not only significantly shorter than in Ppt1−/− neuronal cultures (50.41 ± 2.71 μm vs 65.02 ± 2.51 μm) (Fig. 8d, e), but also had fewer secondary neurites (4.2 ± 0.11vs 5.69 ± 0.4 secondary neurites) (Fig. 8g). 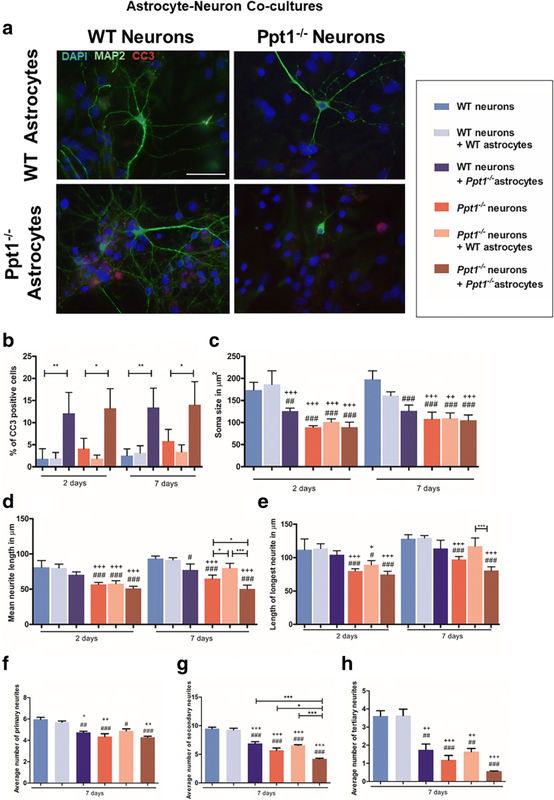 In contrast, WT astrocytes appeared to improve Ppt1−/− neurite outgrowth (80.02 ± 3.31 μm) (Fig. 8d-e), but had no discernible impact on Ppt1−/− neurite complexity (Fig. 8f-h). The overall impact of Ppt1−/− astrocytes appeared to be primarily detrimental to neuronal health, adversely affecting their morphology rather than triggering their death. Although the morphological defects of Ppt1−/− neurons can be partially restored by WT astrocytes, their survival is not improved, which suggests an intrinsic defect in Ppt1−/− neuronal survival, despite any possible cross-correction effect of Ppt1 enzyme secreted from WT astrocytes. We next grew co-cultures of microglia with neurons, in order to assess the impact of these cell types from mice of different genotypes upon each other and revealed a profound impact of Ppt1−/− microglia upon neuron survival (Fig.9a). Cell death as indicated by CC3 staining appeared significantly higher in Ppt1−/− neuron/ Ppt1−/− microglial co-cultures than in WT neuron/ Ppt1−/− microglial co-cultures, Ppt1−/− neuronal cultures and Ppt1−/− neuron/ WT microglial co-cultures (Fig. 9a) There were significantly more double- labelled CC3- and Map2-positive cells in Ppt1−/− neuron/ Ppt1−/− microglial co-cultures (16.05 ± 1.57%) than in WT neuron/ Ppt1−/− microglial cultures (6.31 ± 1.19%) (Fig. 9b). While these data suggest a direct cytotoxic effect of Ppt1−/− microglia upon neurons, a combined effect of Ppt1−/− microglia with the small number of astrocytes also present in these cultures cannot be ruled out. We next investigated neuronal morphology in these co-cultures and saw no significant effects of either WT or Ppt1−/− microglia upon the soma size of neurons of either genotype (Fig. 9c). No detrimental effects of Ppt1−/− microglia could be observed on neurite outgrowth (Fig. 9d-e), or neurite complexity (Fig. 9f-h). However, in Ppt1−/− neuron/WT microglia co-cultures there were more secondary (8.1 ± 0.29 vs 5.8 ± 0.08 Ppt1−/− neurons) and tertiary neurites (2.33 ± 0.2 vs 1.41 ± 0.15 Ppt1−/− neurons) (Fig. 9g-h) than in Ppt1−/− neuron cultures, and these neurites were longer (74.96 ± 0.84 μm Ppt1−/− neuron vs. 87.37 ± 3.35 μm Ppt1−/−/ WT co-culture) (Fig. 9d-e), suggesting a positive influence of WT microglia upon neurite outgrowth and complexity, perhaps by their secretion of Ppt1 enzyme. Overall, these data reveal that, compared to Ppt1−/− astrocytes, Ppt1−/− microglia exert less of an influence upon neuronal morphology, but exert a significant negative effect upon the survival of Ppt1−/− neurons with much less of an impact upon WT neurons. As such, Ppt1−/− microglia do not appear to be intrinsically neurotoxic, but it appears that Ppt1−/− neurons may simply be more vulnerable to their influence. Mixed glial cultures containing both astrocytes and microglia of either genotype were grown to examine whether the presence of other glial cells may improve or exacerbate the phenotypes exhibited by either cell type in monocultures. 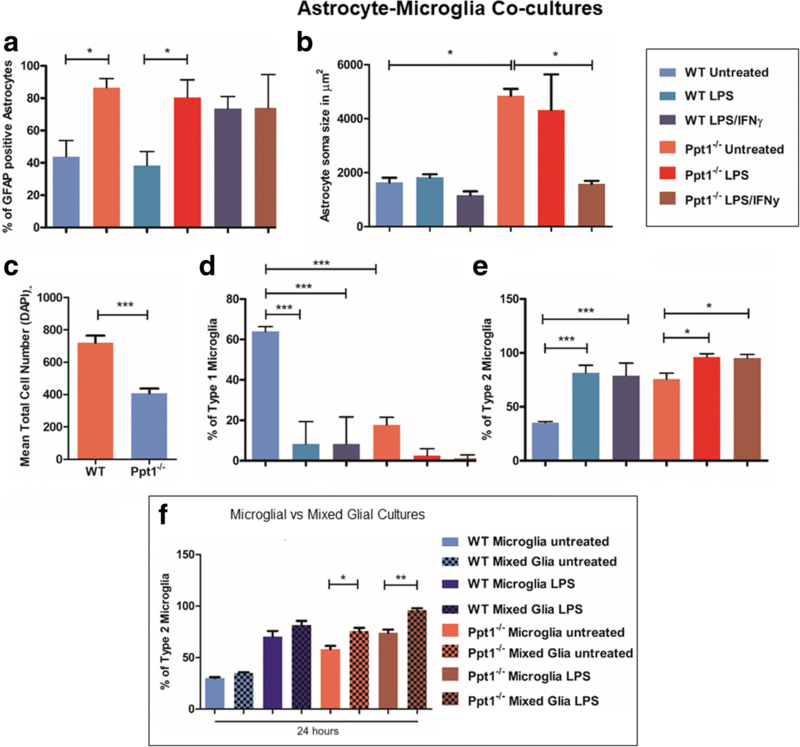 The presence of microglia appeared to have little impact on Ppt1−/− astrocytes, as the percentage of GFAP-expressing cells remained significantly higher in Ppt1−/− cultures under basal conditions and after exposure to LPS alone than in WT cultures (Fig. 10a). Similarly, Ppt1−/− astrocyte soma size in these mixed glial cultures was consistently significantly larger than that of WT astrocytes, until stimulated with LPS and IFNγ, after which Ppt1−/− astrocyte cell body size decreased dramatically (Fig. 10b), as we had seen in astrocyte monocultures (Fig. 1b). Significantly fewer cell nuclei were counted in Ppt1−/− mixed glial cultures (408.1 ± 28.89 vs 720.7 ± 43.19 WT) (Fig. 10c), suggesting that the presence of WT microglia does not improve Ppt1−/− astrocyte survival. The phenotypes seen in Ppt1−/− microglial monocultures also persisted in mixed astrocyte:microglial cultures. Under basal conditions, Type 1 microglia (63.99 ± 1.39%) were the predominant cell type in WT cultures (Fig. 10d), which transformed into rounded Type 2 activated microglia following stimulation (81.53 ± 4.03% LPS, 78.82 ± 6.74% LPS/IFNγ) (Fig. 10e). Under all conditions, activated Type 2 microglia (75.70 ± 3.17% basal; 96.02 ± 1.84% LPS; 95.31 ± 1.91% LPS/IFNγ) were the prevailing type of microglia present in Ppt1−/− microglial cultures (Fig. 8e), however the percentage of activated Type 2 microglia was significantly higher in mixed astrocyte:microglial cultures than in microglial monocultures (Fig. 10e). Furthermore, following stimulation with LPS only or LPS and IFNγ, the percentage of Type 2 microglia significantly increased in Ppt1−/− mixed astrocyte:microglial cultures (Fig. 10f), which was not observed in cultures of microglia alone. 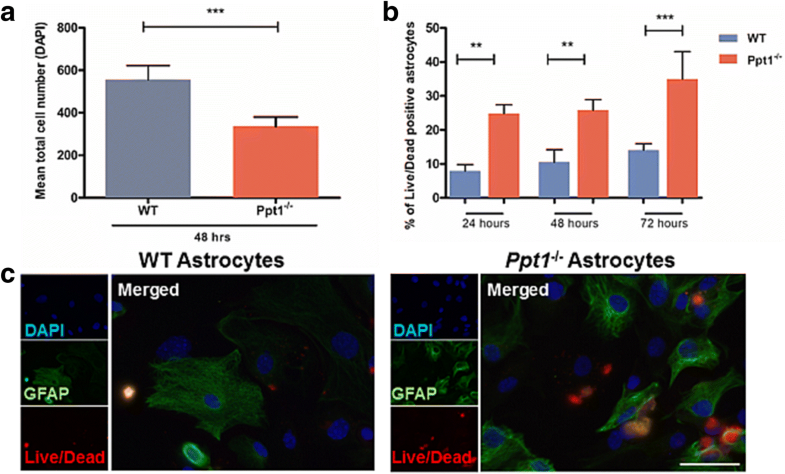 These data suggest that Ppt1−/− astrocytes may drive microglial activation, and also induce a greater microglial response following pharmacological stimulation. The presence of even some Ppt1−/− astrocytes appears to influence morphological measures of microglial activation (Fig. 10), and may also potentially influence any negative impact of microglia (Fig. 9). Therefore, we hypothesised that growing mixed cultures that contain proportionately more astrocytes than microglia, a situation that may more closely reflect the composition if the brain in vivo , might result in the most detrimental environment for neurons. This appeared to be the case with progressively more CC3-positive cells being observed in these co-cultures with time (Fig. 11), with a corresponding negative influence upon neuronal morphology (Fig. 11a). After 7 days in co-culture, cell death levels were at their highest in Ppt1−/− neuron/ Ppt1−/− mixed glial cultures (22.67 ± 2.17% of cells CC3 + ve) (Fig. 11b), a significant increase compared to cell death after 2 days of co-culturing Ppt1−/− neurons with Ppt1−/− mixed glia (14.05 ± 2.33% of cells CC3 + ve), which was comparable to that in WT neuron/ Ppt1−/− mixed glial co-cultures. 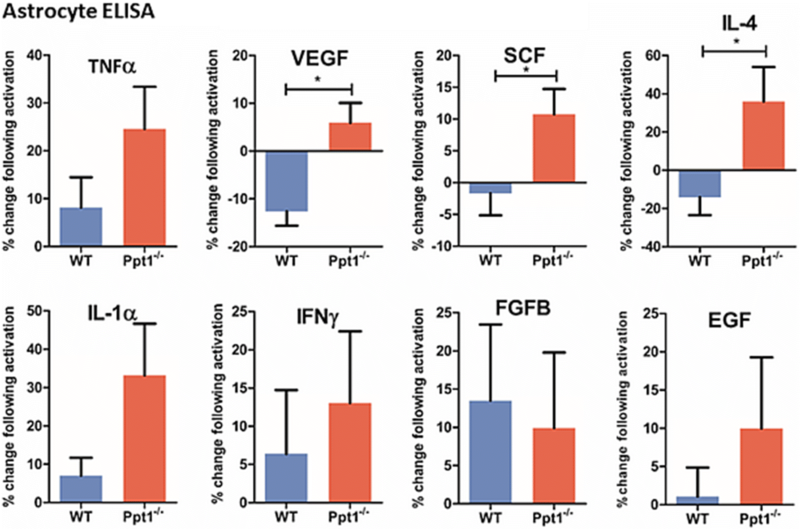 In contrast, there appeared to be a moderate protective effect of WT astrocytes resulting in decreased cell death in Ppt1−/− neuron/WT mixed glial cultures (5.58 ± 0.32% of cells CC3 + ve) (Fig. 11b), perhaps as a result of cross correction by Ppt1 enzyme secreted by these WT cells. Exploring effects upon neuronal morphology revealed that the soma size of Ppt1−/− neurons was not affected by the presence of either WT or Ppt1−/− mixed glia, and remained significantly smaller than their WT counterparts (Fig. 11c). However, when WT neurons were grown with Ppt1−/− mixed glia, their neuronal soma size was significantly reduced, suggesting a detrimental impact of these Ppt1 deficient astrocytes and microglia upon neuronal health (Fig. 11c). Indeed, Ppt1−/− astrocytes and microglia also had a pronounced and rapid impact upon WT average neurite length (Fig. 11d-e), which was significantly shorter after only 2 days in co-culture (64.25 ± 1.24 μm vs WT neurons 84.72 ± 3.13 μm). Although some growth in WT neurite length was apparent with continued time in culture, average neurite length remained shorter after 7 days of co-culture in WT neuron/ Ppt1−/− mixed glial cultures (76.70 ± 4.01 μm) vs. WT/WT cultures (96.59 ± 0.80 μm). The combined presence of Ppt1−/− astrocytes and microglia also significantly impacted neurite complexity with significant reductions in the average number of primary (4.48 ± 0.09 vs 5.61 ± 0.28 WT neurons, Fig. 11f), secondary (6.07 ± 0.45 vs 10.08 ± 0.44 WT neurons, Fig. 11g) and tertiary neurites in WT neurons (1.21 ± 0.12 vs 3.29 ± 0.35 WT neurons, Fig. 11h). In contrast, the presence of WT astrocytes and microglia produced no significant improvements in Ppt1−/− neuronal soma size (Fig. 11c), neurite outgrowth (Fig. 11d-e) or complexity (Fig. 11f-h). Taken together, these data suggest that the presence of both Ppt1−/− astrocytes and microglia has the most significant detrimental effects upon neurons, not just upon their morphology, but also upon the survival of both WT and Ppt1−/− neurons. 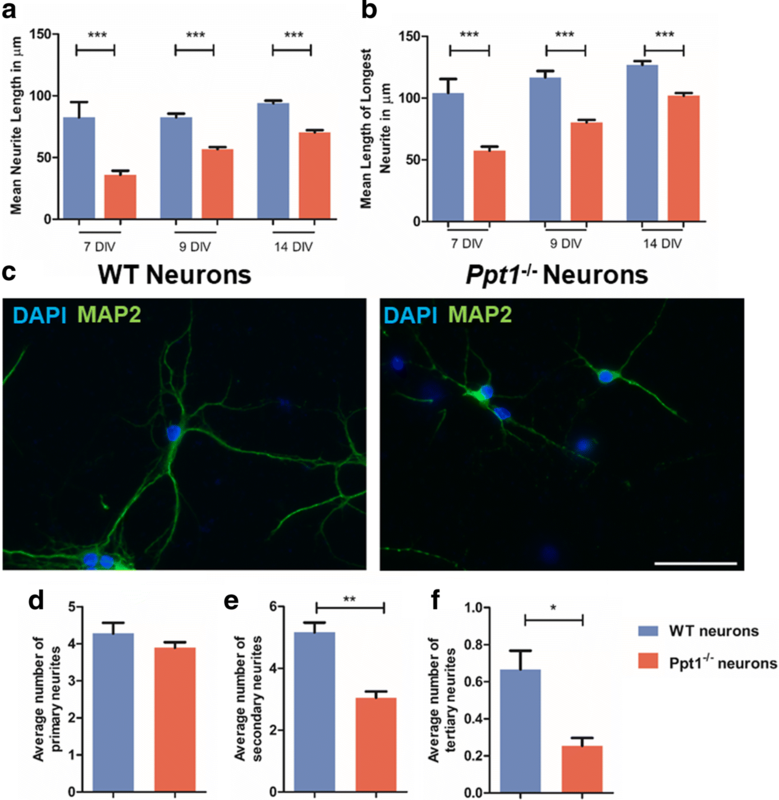 WT astrocytes and microglia were not capable of rescuing the pronounced defects of Ppt1−/− neurons, providing further evidence that these neurons are intrinsically more vulnerable than WT neurons. The purpose of undertaking this tissue culture study was not to replicate disease progression in the Ppt1 deficient brain, but rather to assess intrinsic defects in Ppt1−/− glial biology. Indeed, in addition to detailing defects in the morphology and survival of neurons, this study is the first to characterize Ppt1−/− glia in vitro. Our data reveal that not only do Ppt1−/− microglia and astrocytes exhibit a range of abnormal phenotypes, they also appear capable of harming neurons, especially if these neurons are Ppt1 deficient. Whilst Ppt1−/− astrocytes predominantly affect neuronal morphology, the presence of Ppt1−/− microglia alone was enough to impact neuron survival, a negative influence that was greater if both Ppt1−/− astrocytes and Ppt1−/− microglia were present, resulting in pronounced neuron loss. These data suggest that glial cells are more affected by Ppt1 deficiency than previously anticipated, and this may directly influence neuron survival in CLN1 disease and it will be important to explore this also occurs in vivo. However, as discussed below, these defects in Ppt1 deficient glia are quite distinct from those we recently reported in similar experiments in CLN3 disease , another member of this group of disorders in which a negative influence of functionally compromised glia upon neuronal survival is evident. Taken together, these data provide further evidence that although these disorders broadly share similar features, they may differ markedly in how individual cell types are impacted by disease. Compared to the morphologically attenuated glial activation that is evident in CLN3 disease , mouse models of CLN1 disease exhibit much more pronounced and early onset activation of both astrocytes and microglia in the same CNS regions that later display the most neuron loss. This includes the thalamocortical system , cerebellum , and long before these events occur in the brain this glial activation is also evident at all levels of the spinal cord . These reactive events are accompanied by a pronounced upregulation of chemokines and cytokines in vivo , that can be normalized by a combination of brain directed gene therapy and anti-inflammatory drugs . Our data demonstrate that cultured Ppt1−/− astrocytes are very responsive to pharmacological stimulation (Figs. 1), and Ppt1−/− microglia appear morphologically more activated even under basal unstimulated conditions (Fig. 5). This is quite different to the properties of cultured Cln3−/− astrocytes and microglia that both respond slowly and incompletely , mirroring the relative extent of morphological transformation of these cell types with disease progression in murine CLN1 and CLN3 diseases in vivo [23, 35, 37, 38]. Another marked phenotypic difference between glia isolated from mouse models of these two forms of NCLs is the reduced secretion of chemokines and cytokines by Cln3−/− astrocytes and microglia in culture , compared to the elevated secretion of a subset of these factors by Ppt1−/− astrocytes (Fig. 2) and microglia (Additional file 1: Figure S1), data that mirrors in vivo findings for much broader elevation of such factors . Any comparison between in vitro and in vivo studies must be made with caution. However, there are differences between these expression profiles in terms of which chemokines are upregulated. These may reflect the markedly different ages of the mice when these studies were performed, the inherent differences in a tissue culture environment and the living brain, as well as the pharmacological stimulation used in the current in vitro study. Another fundamental difference between data from Cln1 and Cln3 glia, is that compared to the disruption of intermediate filaments seen in Cln3−/− astrocytes , the current study found no evidence for any similar cytoskeletal defects in Ppt1−/− astrocytes (data not shown). Taken together, these data emphasize that although glia from both of these mouse models of NCL display a variety of abnormal phenotypes in culture, and that these consistently affect astrocytes more than microglia, the nature and extent of these glial defects differ markedly between CLN1 and CLN3 disease. One of the most striking findings of the current study is the compromised survival of Ppt1−/− astrocytes in all culture conditions, a phenotype not exhibited by Cln3−/− astrocytes in vitro . It will be important to determine if this vulnerability of Ppt1−/− astrocytes is related to abnormal calcium signalling properties that they display (Fig.4), but it might be expected that these raised cytoplasmic calcium levels would contribute to their death. It will be crucial to determine if Ppt1−/− astrocyte survival is also impaired in vivo to a similar extent that we have observed in vitro. Although there is already evidence for fewer astrocytes expressing S100β and glutamine synthetase in Ppt1−/− mice during the later stages of the disease , which points towards a loss of these astrocyte populations in vivo, this issue is yet to be fully resolved. Our in vitro findings do provide further corroborative evidence for an inherent vulnerability of Ppt1−/−astrocytes, and this would be expected to adversely impact neurons and their survival during CLN1 disease progression. However, the exact mechanisms underlying such cell-specific vulnerability of astrocytes remain unclear and will need to be investigated in subsequent in vivo studies. CLN1 disease is perhaps the most profoundly neurodegenerative form of NCL, with near total cortical neuron loss at autopsy . However, the mechanisms by which a deficiency in a de-palmitoylating lysosomal enzyme leads to this remarkably dramatic neuron loss remain unclear. Previous studies culturing neurons derived from Ppt1−/− mice surprisingly did not reveal any overt defect in their survival, or firing properties, but did find alterations in the synaptic vesicle pool size . These are suggestive of an early stage synaptic pathology, and Ppt1−/− mice do go on to display progressive changes in synaptic organization within the thalamocortical system . Our data in this study provide new evidence that Ppt1−/− cortical neurons show compromised survival in our culture conditions (Fig. 6c), display a markedly smaller cell soma (Fig. 6d) and compromised neurite organization in vitro, that involves secondary and tertiary neurites rather than those arising directly from the soma (Fig. 7d-f). This neuron loss was most pronounced for GABAergic interneurons (Fig. 6b), consistent with in vivo data from these Ppt1−/− mice [3, 23]. Taken together, these data reveal that Ppt1 deficiency does not by itself result in the same profound extent of neuron loss seen in vivo, suggesting that other non-neuron-intrinsic mechanisms may operate to influence neurodegeneration in this disorder. There is an increasing body of evidence that glial activation and/or dysfunction have an active role in the pathogenesis of several neurodegenerative disorders [1, 36, 40, 44]. Although not necessarily themselves instigators of neurodegeneration, any disruption of the normal support functions served by astrocytes or microglia may plausibly lead to neuron dysfunction or loss. The concept that glial cells can contribute to disease severity and accelerate its progression is perhaps most advanced in ALS and Parkinson disease, but it is becoming apparent this principle also extends to several lysosomal storage disorders. Lysosomal dysfunction and disrupted autophagy were thought to lead to the toxic role of astrocytes in multiple sulfatase deficiency, with the suggestion that a genetic defect in astrocytes alone was sufficient to drive the disease . Microglial activation has also been suggested to contribute adversely to the pathogenesis in various LSDs including MPSI, MPSIIIB, Sandhoff disease and GM2 gangliosidosis [22, 33, 48], but the extent to which this happens in the NCLs is less clear. The close correlation between the sites where early localized glial activation occurs in every form of NCL, and the extent of subsequent neuron loss [9, 34], has always begged the question of whether these events may be mechanistically related to one another. So far, the role of glia in these disorders has been investigated in most depth in CLN3 disease, and there is recent evidence for a negative influence of Cln3 deficient microglia  and astrocytes  upon neurons. We have recently extended these observations, using very similar primary culture and co-culture systems used in the present study . This approach revealed a variety of defects in the biology of Cln3−/− microglia and astrocytes, and when grown in co-cultures, these dysfunctional glia harmed healthy neurons and resulted in the death of Cln3−/− neurons . These data prompted us to investigate whether there was any influence of Ppt1−/− astrocytes and microglia upon neuron health in CLN1 disease. Despite the marked differences in the phenotypes displayed in vitro by Ppt1−/− glia (this study) and Cln3−/− glia , a consistent feature is that astrocytes and microglia deficient in either gene exert a negative influence of upon neuronal morphology and survival. The relative contributions of either Cln3−/− astrocytes or microglia to these processes are yet to be defined, as are the underlying mechanisms, but the current study has provided the first insights into the negative influence of glia in CLN1 disease. Our data reveals that this adverse impact varies between cell types, with Ppt1−/− astrocytes only exerting a moderate influence on neuronal morphology (Fig. 8), whereas Ppt1−/− microglia are capable of inducing the death of neurons (Fig. 9), especially if these neurons are themselves Ppt1 deficient. These differences likely reflect how each of these cell-types are compromised by Ppt1 deficiency, and it will be important to investigate these mechanisms by transcriptional profiling. Whatever the underlying mechanisms may be, this adverse influence appeared to be exacerbated when both Ppt1−/− astrocytes and Ppt1−/− microglia were present (Fig. 11). This is consistent with recent data suggesting that under certain conditions microglia may prime astrocytes to become neurotoxic . However, the specific factors implicated in this priming mechanism were not all upregulated by Ppt1−/− microglia, and it may be that different mechanisms operate in CLN1 disease. However, data from our co-cultures of Ppt1−/− astrocytes and Ppt1−/− microglia together (without any neurons present) suggest that these mutant astrocytes appear to drive these Ppt1−/− microglia to become further activated (Fig. 10). Indeed, it seems plausible that the toxic effect of Ppt1−/− microglia (Fig. 9) may be exacerbated by the consequence of impaired Ppt1−/− astrocyte function and/or survival to create conditions that promote neuron loss, perhaps via the increased release of IL-1β from microglia (Additional file 1: Figure S1), but this awaits experimental verification. Previous data had suggested astrocyte activation was beneficial in this disorder (Macauley et al., 2011), since disease progression was accelerated in GFAP−/−/Vimentin−/−/Ppt1−/− mice in which glial activation is genetically suppressed. This is in marked contrast to data from our co-culture systems that suggest a negative influence of Ppt1−/− astrocytes upon neuron health (Figs. 8, 11), and it will be essential to validate these effects in vivo. In order to address such issues, we are already generating mice in which Ppt1 can be inactivated in a cell type-specific manner. Such approaches would normally be complicated by the release of Ppt1 enzyme from genetically unmodified cells to cross correct the cell type in which Ppt1 has been inactivated. However, the generation of mice expressing a biologically active membrane tethered Ppt1 enzyme that is not secreted  provides important proof of principle for this strategy, which will be employed in our future studies. Nevertheless, this in vitro study has provided novel evidence for a greater extent of dysfunction in Ppt1−/− glial cells than was previously anticipated and highlights the need for targeting glial cells in developing therapies for CLN1 disease. Gene therapy using newer generations of adeno-associated viruses has shown increasing efficacy, especially if these are targeted simultaneous to the brain and spinal cord . These vectors predominantly transduce neurons, and these would secret Ppt1 enzyme to cross correct Ppt1 deficient glia within the CNS and correct their defects [10, 15, 45]. Regardless of such cross-correction, the administration of anti-inflammatory compounds to Ppt1−/− mice provides additional benefit above gene therapy alone , and greater therapeutic efficacy may yet be provided by testing other drugs of this type. In a clinical setting, such neuroimmunomodulatory or anti-inflammatory approaches may be of use either before gene therapy can be administered or as an adjunct to gene therapy. The NCLs have been grouped together traditionally on the basis of certain broadly similar clinical and pathological themes, but as new data emerge it is becoming evident that this is an oversimplification. It is clear that cultured astrocytes and microglia generated from CLN1 (this study) and CLN3 mice  are dysfunctional and exert a negative influence upon neuron health and may ultimately contribute to neurodegeneration. However, as the CLN1 data in this study reveal, the nature of these events differs markedly between these two major forms of NCL. Perhaps this is not surprising given that these two forms of NCL are caused by mutations in genes that encode such different types of proteins, one a lysosomal hydrolase (CLN1/PPT1) and the other a transmembrane protein whose function remains obscure (CLN3). Nevertheless, these findings have direct implications for our understanding of the cellular pathogenesis of these disorders and in this respect, it will be important to extend these studies to other forms of NCL. Brenda P. Williams and Jonathan D. Cooper contributed equally to this work. Prof. Tammy Kielian, Dr. Jill Weimer, Dr. Alison Barnwell, Dr. Allison Najafi and Dr. Hemanth Nelvagal are thanked for their very useful comments upon the manuscript. This study was supported by NIH NINDS 043205 to MSS and JDC, Saoirse Foundation and Irish Health Research Board to JDC and BPW, a Medical Research Council DTA studentship to JL, the Batten Disease Support and Research Association (USA), the Batten Disease Family Association (UK), The Natalie Fund and the Bletsoe Family. Prof. Tammy Kielian, Dr. Jill Weimer, Dr. Alison Barnwell, Dr. Allison Najafi and Dr. Hemanth Nelvagal are thanked for their very useful comments upon the manuscript. The study was designed and supervised by JDC and BPW, with the input of all the authors. JL performed all aspects of the tissue culture experiments, and analysed these data; the microglial cytokine assays were performed with and supervised by JMP; the calcium imaging experiments were performed by JL and LJH and supervised by EL-E; MSS provided the Ppt1 deficient mice, and advice on their maintainence and breeding. The manuscript was written by JDC, BPW, and JL with input from all the authors, who approved the final version of the manuscript. All applicable international, national, and/or institutional guidelines for the care and use of animals were followed. Specifically, all animal procedures were performed in accordance with the UK Scientific Procedures (Animals) Act of 1996, under the UK Home Office Project License number 70/7364.